The beloved Brooklyn Book Festival is a weeklong celebration of the borough’s literature lovers and the writers who cater to them. Kings County bookworms, it’s time to descend from the comfort of your cozy home libraries and attend the annual Brooklyn Book Festival. By far the largest literary event in New York City, the fest is jam-packed with critically acclaimed indie novelists, internationally renowned bestsellers, and every kind of writer in between. Expect names like—deep breath—Joyce Carol Oates, Karl Ove Knausgård, Chris Hayes, Meghan O’Rourke, Jonathan Lethem, Hisham Matar, Marita Golden, Claire Messud, Carolyn Forché, Sarah Dessen, Alexandra Bracken, and Maira Kalman among the more than 300 beloved writers of fiction, nonfiction, poetry, and graphic novels from Brooklyn and beyond who are participating. The common thread throughout the Brooklyn Book Festival this year is the exploration of many of today’s charged social and political issues, ranging from complex family relationships to immigration and refugees. After a decade of experience, the organizers have once again assembled a number of compelling panel discussions featuring our literary heroes on topics that matter more than ever—“Best of Brooklyn: Colson Whitehead and Lynn Nottage in Conversation,” “Books as Tools of Resistance,” and “Refugee Reportage,” to name just a few. The best way to ensure a personal experience at the vast and somewhat overwhelming event is to familiarize yourself with the schedule and plan ahead, keeping in mind that the main Festival Day takes place on Sunday, September 17, in Downtown Brooklyn. 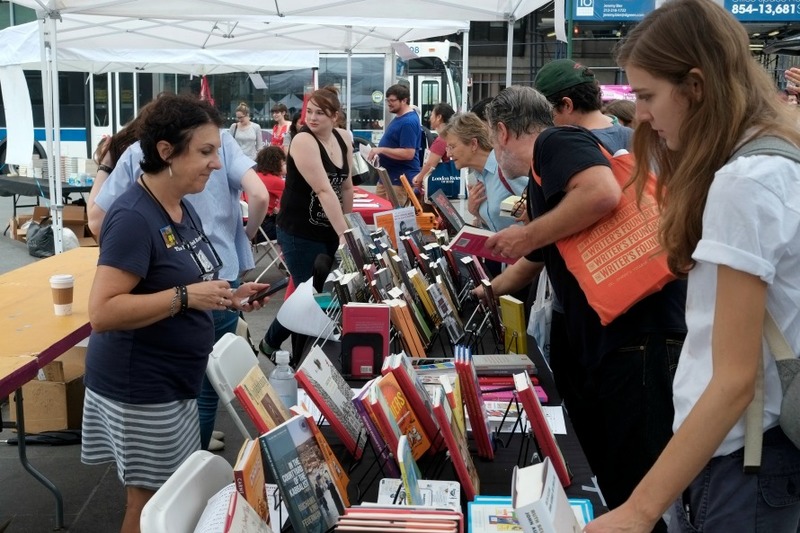 There will be 200 booksellers at the lively Literary Marketplace to wander among, but discussions and readings will also be held on 14 stages around Borough Hall and the adjacent plaza and Columbus Park. Our picks? The timely “It’s Personal, Not Just Policy,” a panel discussion about the struggles facing immigrants through shared personal stories, and the perennial favorite, “Literary Lions,” where local writers talk shop. Speaking of local writers, could your kid be the next bestselling author? There is something to inspire readers and writers of all ages here. On Children’s Day on September 16, YA author Lilliam Rivera will be giving away copies of her new book, The Education of Margot Sanchez, and backpacks to the first 100 who attend her reading in the Bronx. Children ages 4 to 9, meanwhile, are invited to join the “Raise Your Voice” workshop, encouraging the value of advocacy. At the top of our list for the entire family, though, is “Illustrator Smackdown,” a live-action drawing competition, as well as “The Nocturnals at the Prospect Park Zoo,” which includes a read-aloud of Tracey Hecht’s The Fallen Star preceding an exploration of the nocturnal animals at the zoo. 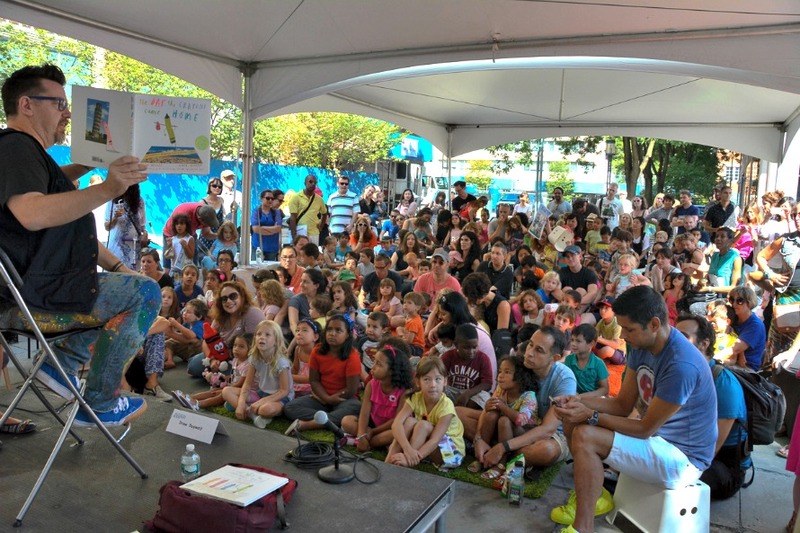 Drew Daywalt reads from The Day the Crayons Came Home at the 2015 Brooklyn Book Festival Children’s Day. Why You Should Go: If you and your family are passionate about books and community, the Brooklyn Book Festival is an opportunity to meet your literary heroes, find new ones, and encourage both the love of reading and social consciousness. While the featured books and discussions vary from the painful to the humorous, the spirit of the festival is respectful, informative, and inspiring. Get in touch with our helpful experience advisers to secure tickets to any of the bookend events or for assistance in rounding out your day at the fest with lunch or dinner reservations in the neighborhood.